Fulfilling North Korea’s Commitment to Denuclearization Could Have High Cost - Integration Through Media ....! 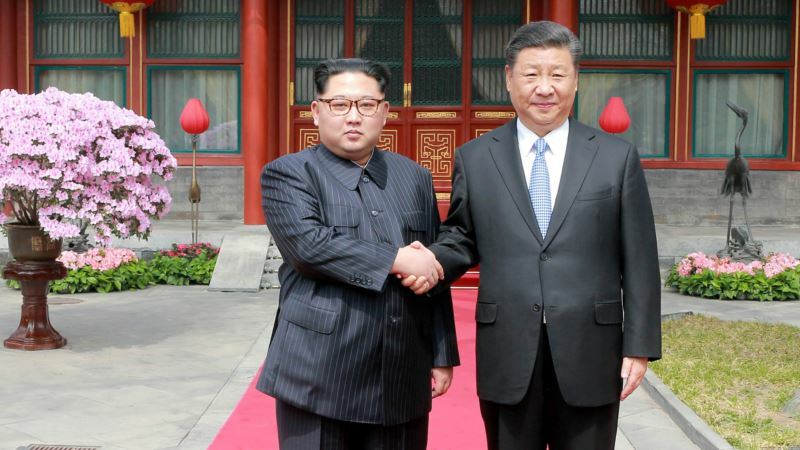 (VOA): While meeting with Chinese President Xi Jinping, North Korean leader Kim Jong Un may have revealed a glimpse of his vision of denuclearization that experts say could conflict with Washington’s expectation of a denuclearized North. Chinese state news agency Xinhua reported that Kim confirmed his openness to discuss denuclearization during a secretive four-day excursion that began on Sunday with a train trip from Pyongyang to Beijing to meet with Xi. “It is our consistent stand to be committed to denuclearization on the peninsula,” said Kim on his first foray outside North Korea since inheriting power from his father in 2011. As reported by Xinhua, Kim’s commitment echoed the message that South Korea envoys conveyed to U.S. President Donald Trump in Washington on March 8, days after meeting with Kim in Pyongyang. U.S. President Donald Trump, who has agreed to meet with Kim, welcomed this week’s meeting between Kim and Xi in a tweet saying, “Look forward to our meeting.” What is denuclearization? But despite Kim’s commitment to denuclearization, many experts are concerned that his vision of denuclearization could complicate the U.S. effort to denuclearize the North. According to Xinhua, Kim also said the nuclear issue could be resolved through “progressive and synchronous measures” by his regime and the U.S. Robert Manning, a senior fellow at the Atlantic Council, said Kim’s statement contains “a lot of loaded rhetoric” to “unpack.” Manning said Kim’s statement indicates that he mostly likely will demand the U.S. “remove its hostile policy” or what he perceives as a threat posed to the Kim regime by reducing sanctions, ending U.S.-South Korean military exercises and removing U.S. troops as well as the nuclear umbrella over South Korea and Japan. Kim expects the U.S. to take “synchronous measures” in providing these concessions as the North agrees to take action-for-action steps, Manning said. Evans Revere, a former State Department official who has negotiated with North Korea extensively, said these demands are consistent with North Korea’s definition of denuclearization. “What the North Koreans have done in conveying this to the Chinese is an effort to buy some time by giving a vague reference to some future denuclearization that they are actually not committed to,” Revere said. Ken Gause, an expert on North Korea and its leadership and a director at research and analysis group CNA said, “[His statement] shows that Kim is looking for a phased process that is conditional on U.S. and [South Korea] providing incentives that meet the requirement of creating an atmosphere of peace and stability.” Christopher Hill, who negotiated with the North as the head of the U.S. delegation under the George W. Bush administration, believes North Korea needs to demonstrate that it will agree to a verification protocol on denuclearization for diplomatic efforts to advance. “The issue will come down to whether they are prepared to be serious about this,” Hill said. “By serious, they need to adhere to some international standards of verification.” Gary Samore, a former White House coordinator for arms control and weapons of mass destruction under the Obama administration, said, “If Trump really believes that he is going to go to this meeting and achieve nuclear disarmament overnight through some process of intimidation and promises, then I think he’s going to leave the meeting very disappointed.” ​Inter-Korea summit set Seoul and Pyongyang held a high-level inter-Korean talks Thursday at the village of Panmunjom on their border and agreed to have the summit between the leaders of the two Koreas on April 27 at the Peace House on the southern side of the Panmunjom. The prospects for nuclear summits with North Korea opened up when South Korean envoys traveled to Pyongyang at Kim’s invitation. South Korean envoys then traveled to Washington to deliver Kim’s invitation to a U.S.-North Korea summit that Trump has agreed to have by May. There is no official confirmation of the summit from North Korea. Youngnam Kim contributed to this report, which originated on VOA Korean.